I mentioned in my last post that I’d taken a trip in February and would be happy if I managed to write about that before March ended. Since I want to be happy, and it’s almost the end of March, here I am writing. I left my mountain on a Thursday in mid-February, the ankle I’d injured skiing not quite one week before my departure wrapped securely in a brace. 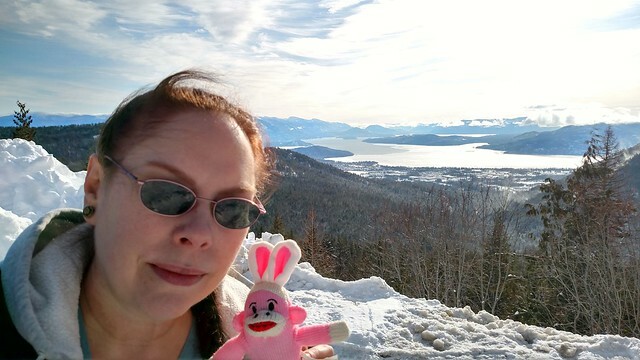 I was heading to Weetacon, so my travel companion was the Easter bunny-eared sock monkey I’d been given at Weetacon in 2013. I flew out of Spokane (when planning I decided it was not wise to road trip to Wisconsin in the winter and risk running into bad weather and miss all those ski days in the bargain), connected in Minneapolis to Milwaukee, all going pretty smoothly despite my having gotten one of those sub-economy fares where you don’t get to pick your seat and face other restrictions, some of which were ameliorated by my having the airline’s co-branded credit card. Originally, I’d been planning to drive to Green Bay that night, but a look at the weather forecast earlier in the week convinced me to change that plan; I felt vindicated when I pulled in to the Comfort Inn I’d reserved about a half hour from the airport and nearly got blown over by the wind whipping the snow around as I got my luggage out of the rental car. 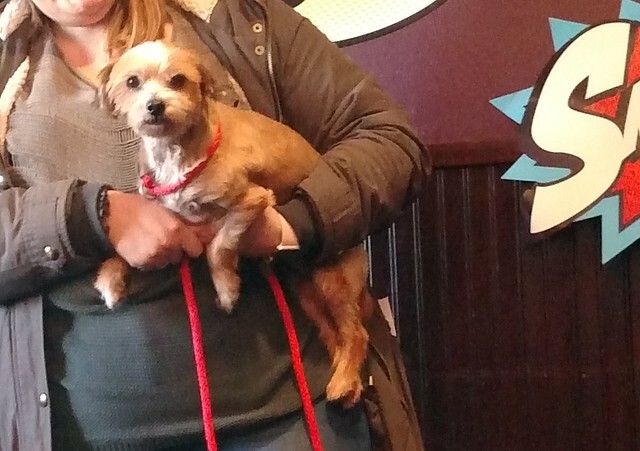 I made it to Green Bay the next day in time for opening ceremonies, which featured an adorable dog from one of the charities Weetacon supports. Then it was off to the fun park to play video games and laser tag. I debated whether my ankle was up to laser tag and decided it probably wasn’t but I don’t get many opportunities to play laser tag with friends, so I was going to go for it. I did, and I sucked, what with the lack of mobility, but it was a lot of fun and I’m glad I did it. Next up was the traditional chicken hall feast, this year featuring a lot of fish because it was Friday. But we weren’t done yet; after the feast we returned to the hotel for a superhero themed karaoke party. 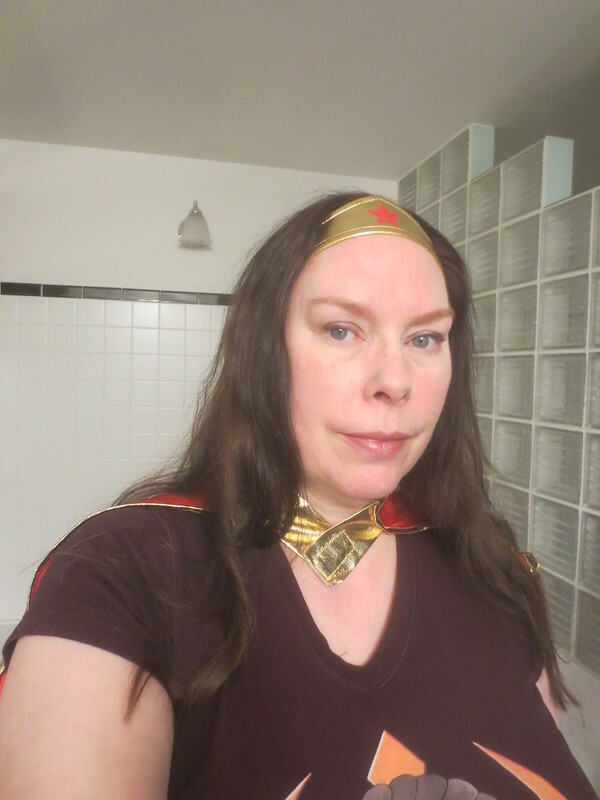 I went as Wonder Woman on casual Friday. Saturday’s big event was the charity raffle. Mindful of my retirement budget, I didn’t put as many tickets in as during my raffle heyday. I was happy to win a beautiful soft handmade scarf and a somewhat snarky cross stitch piece. 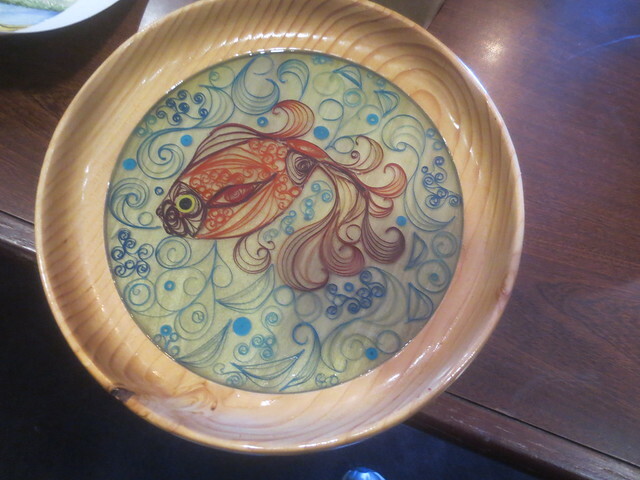 Someone else won this gorgeous handmade bowl (and the other one I put tickets in on), so I was glad I’d taken a photo to remember it by. I’m not quite sure what happened between the end of the raffle and the start of bar night down the street. If it were at all interesting, I would have taken photos, and I didn’t, so maybe I was being wise and just relaxing between events. Sunday was pretty quiet compared to the prior two days. Closing ceremonies wrapped up the official schedule, but lots of us were staying over until Monday (and some who’d planned to leave Sunday ended up having to stay over due to weather-related flight cancellations) so the fun continued in various ways, including quite of a lot of us gathering for dinner in the hotel pub that night. 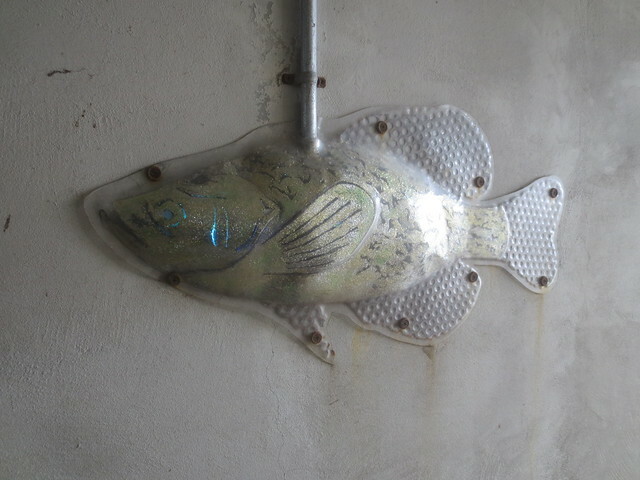 I decided I needed some exercise, so in the afternoon I bundled up and took a walk along the river, where I encountered, among other things, metal fish on the walls of a pedestrian underpass; it was quite cold and windy, even for my northern tier mountain-acclimated self, so it was a shorter jaunt than I’d had in mind, but it was still good to get out for a bit. When I planned the trip, it seemed like going for only a long weekend was not the most efficient use of my travel dollars, so Monday I headed out of Green Bay toward Michigan to spend a few days seeing as many friends as I could, which was not nearly as many as I wanted to. 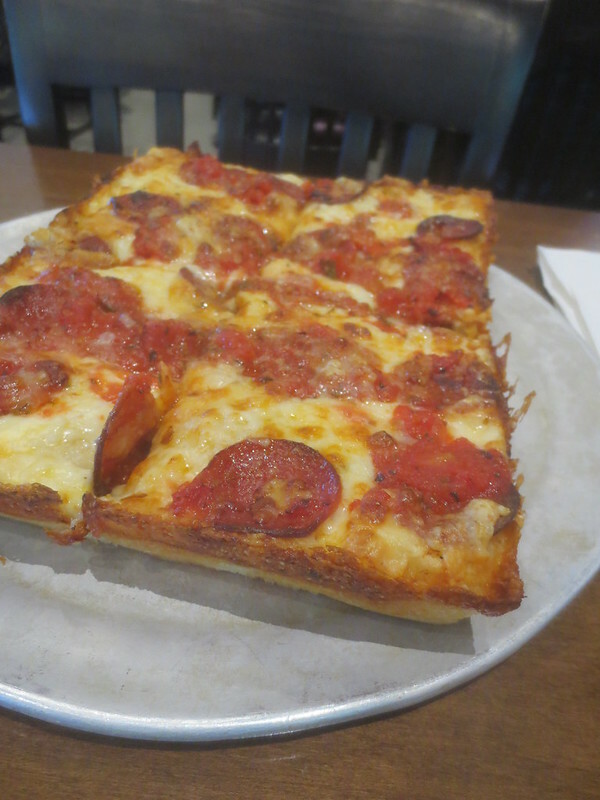 I also ate as many favorite foods as I could, including Buddy’s pizza; there is nothing quite like it out here in the Inland Northwest and I miss it. After what felt like almost no time at all in my old stomping grounds, I had to drive back to Milwaukee to fly home. As much as I enjoyed seeing everyone I was able to get together with, I was ready to get back to my mountain.